UnioNation performed original songs and classic hits at a celebration commemorating the IAM’s 125th anniversary at Local Lodge 709 in Marietta, GA. Their CD is expected to be available for purchase before the end of the year. (Bill Burke / Page One Photography). IAM members express their solidarity in a number of ways – on the strike line, at the ballot box or simply with some words of encouragement to a union brother or sister. For unioNation, a band founded by IAM members who hope their songs will inspire union and non-union workers to fight for justice on the job, solidarity means a guitar chord, a chorus verse, and soon their very own album. After performing in Toronto, Baltimore, Atlanta and New Mexico since its formation in 2012, the IAM members that make up unioNation decided it was time to give their music a wider reach. In late July, the 22 musicians and vocalists came together at the William W. Winpisinger Center in Hollywood, MD to record 24 original labor songs. Click here to see the new Machinists News Network video highlighting unioNation. 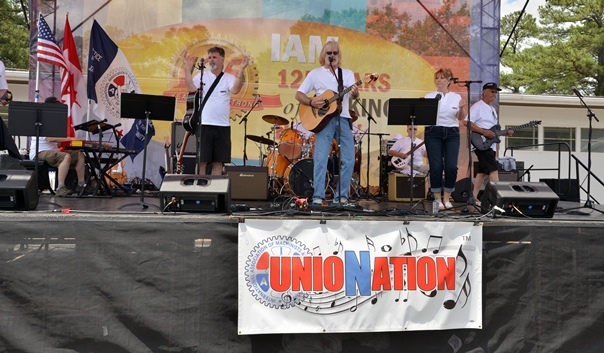 Alex Stone, a Network Administrator at IAM Headquarters who doubles as a vocalist and guitarist for unioNation, says the band is an opportunity to educate young people about the benefits of joining a union. The band has proven to be an outlet for IAM members with a musical talent and an urge to spread the word about the labor movement. Its first album will feature a diverse mix of musical genres that represent the expertise of its members – who came from as far away as British Columbia to be a part of this groundbreaking project. “With unioNation, we’re taking back our pride in being workers and union members and we’re able to express it in a really joyful way,” said Alistair Haythornthwaite, an IAM Local 692 member and unioNation vocalist and guitarist. The band’s first CD is expected to be released by the end of the year. Click here to stay up-to-date with unionNation by liking their Facebook page.